No, I'm not pregnant! It's even better than that! I suppose pregnancy isn't an enjoyable experience for everybody. 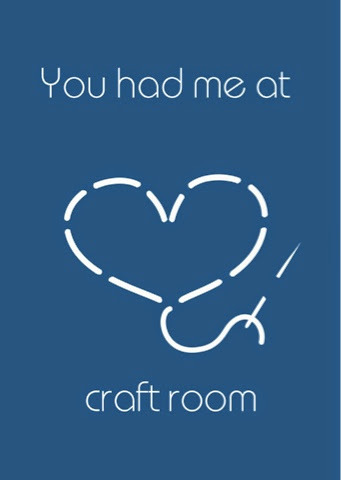 Moving on, I'm getting a custom made sewing room! Now as some of you know I already have a sewing room, which I have in my house, however we have being planning for a while to knock down our absestos filled garage/shed, rebuild with a better garage/shed/ workshop area, carport and sewing room! I figure while we are spending thousands to build it, it won't cost that much more to add a sewing room. My reasoning is so intelligent eh? We're doing the most of the work ourselves unless we don't have the skills of course, but with my husband's work and knowledge and the help of qualified friends we should be able to have it up in a 3-4 month or by December timeframe. Slow and steady wins the races in our household. Now onto the best bit, designing the sewing room! In the photo below, this was our first working plan, ignore the dimensions and the window length. 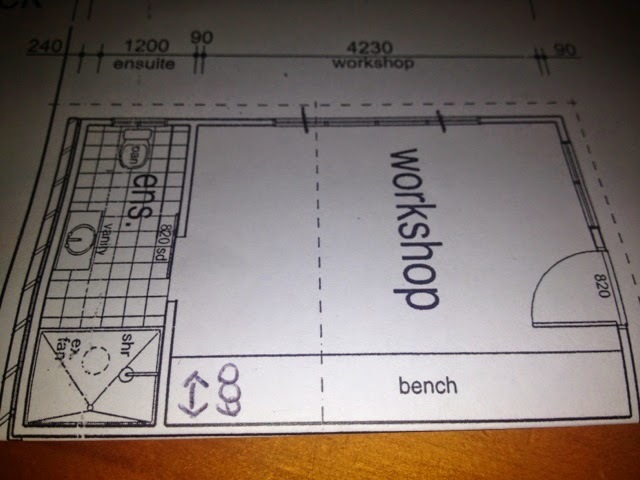 To get it through council, it was suggested that we call it a workshop so that the council doesn't think it will become a bedroom, as that requires different regulations. My room will be 5550 long by 3500 wide. Along one wall I'm having built in cupboards (600m) with doors. Not sure if they will be sliding or not. If they are sliding, 1-2 doors will be mirrored. I'm keeping my current desk, she's a massive beast. We will have to take her apart to be able to fit her through the door! I'm having a small bathroom complete with a shower, 1000l by 3500w this gives us room for change in the later teenage year or if want to sell, it will help with marketing. ideally one that slides down into position but I haven't seen this in Australia. It's important to me that my board has a permanent spot to live and won't take up a lot of space. The cutting biggest table I can get or make. A space for friends to sew. A couch to sit & relax. Do you have any advice on sewing room setups or building your own? Feel free to link to anyone's that you may have read about. Ideally I want it be able to put all my plans down on paper, even my desk layout, so when the time comes to build, there won't be any miscommunication.